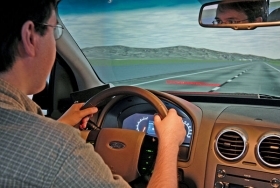 Ford's VIRTTEX simulator test: To find a song on an MP3 player, a driver took his eyes off the road for 30 seconds. Using Sync, it took 5 seconds. DETROIT -- In Ford's VIRTTEX simulator in Dearborn, Mich., a motorist is asked to find a song on an MP3 player. As his simulated car travels 60 mph, the driver works the music player with one hand, the steering wheel with the other. His eyes move constantly from road to gadget and back. By the time he finds the song, he has spent 30 seconds with his eyes off the road, including normal glances to check mirrors. Chilling to watch, the video illustrates a major problem confronting the auto industry: driver distraction. Technology is pouring into cars. It has become a big selling point. But concerns about safety are escalating. Texting while driving is the current hot-button issue, but it represents only one of the many alluring features that draw drivers' attention away from the road. The race to provide so-called connectivity in cars has automakers playing the dual roles of hero and villain. The very companies placing technologies such as graphics-rich navigation screens and auxiliary input ports in front of the driver are under increasing pressure to keep driving safe. According to the National Safety Council, driver distraction was involved in 16 percent of fatal crashes in the United States in 2008. Six states ban the use of hand-held cell phones by drivers, and more than 20 have banned texting while driving. U.S. Transportation Secretary Ray LaHood has launched a high-profile campaign against distracted driving. In early April, he kicked off a pilot program in Hartford, Conn., and Syracuse, N.Y., that encourages police officers to pull over and ticket drivers caught texting behind the wheel. According to The Wall Street Journal, LaHood even considers hands-free Bluetooth phone systems too distracting. Ford recorded the simulator test to illustrate the benefits of its Sync technology, which enables drivers to control music players and phones by voice. In the video, after the driver tries to find the song manually, he uses a voice command to find it hands-free. Using his voice, he takes his eyes off the road only five seconds. For automakers, the rule of thumb is if a task takes more than 15 seconds to perform while the car is parked, it should not be allowed in the car, or the function should be disabled while the vehicle is moving. But automakers' jobs are getting more complicated with the rising popularity of smart phones, loaded with attention-grabbing applications. Experts say drivers are starting to demand the same experience in vehicles that they can get elsewhere. "It's become a competitive issue," said Roger Lanctot, senior analyst for the technology research firm Strategy Analytics. "Customers are now coming into dealerships and saying, 'Can I interface my iPhone with the car?' It's a purchasing checkoff item." For automakers and suppliers, that means either allowing people to fumble with their phones while driving or integrating phone apps into the car's hardware in a way that minimizes danger. Just as it did with Sync, Ford is getting ahead of the issue by integrating smart-phone apps into the car. Last month the company announced that the 2011 Fiesta would be the first vehicle to offer Ford's AppLink software, which will give drivers hands-free access to popular smart-phone applications. Automakers and suppliers say voice technology still holds the best promise of keeping distraction at bay. "Just about every OEM that I talk to or interact with in the industry, regardless of continent, is watching Ford very closely and treating Ford more or less as the benchmark for integrating social networking technology in the car," said Lanctot. "They've really set off a technology explosion in the automotive market. All the competition is scrambling to come to grips with what they've done." At the recent SAE World Congress, supplier Delphi Corp. demonstrated software that can take a driver's smart-phone screen, complete with the applications and icons, and replicate it on the vehicle screen. Functions considered too distracting would be blocked while the car is moving; others would operate using either voice commands or text-to-speech technology. That means a driver could send and receive text messages hands-free. Bob Schumacher, Delphi's general director of advanced product and business development, said automakers are "extremely interested" in such systems. "They recognize that nearly all of their customers have smart phones and want to use them in the car," Schumacher said. But experts caution that automakers have to police what drivers can do in the car and how the applications work with the automakers' own technology. "The automotive OEMs are carrying a big liability," said Kamyar Moinzadeh, CEO of Airbiquity, a Seattle company whose technology gives drivers wireless access to information and services. "That user experience is very important to them, so the automotive OEMs need to be able to control how that application is integrated into the vehicle. "As soon as they integrate it and it causes an issue, nobody goes after the handset manufacturer or the application provider. It's always the automotive OEM." Ford's approach is to choose the kind of smart-phone apps it considers safe, then give outside developers the software tools to adapt the applications to work hands-free. But the rise of smart phones and other mobile devices limits what automakers can control, said Paul Green, a research professor at the University of Michigan's Transportation Research Institute. "The difficulty isn't just what the manufacturer builds in but what people bring in," Green said. Aftermarket consumer electronics companies are also beyond the control of automakers. When it comes to embedding technology in vehicles, automakers turn to recommendations from SAE or guidelines established by the Alliance of Automobile Manufacturers. That's why car companies block out certain navigation functions, such as manual destination entry, while a vehicle is in motion. But Green said the aftermarket companies aren't obligated to follow the lead of automakers. "The manufacturers are trying to do the right thing," he said. "There's a huge problem with the aftermarket stuff because most of it doesn't comply, and they don't even try." Green said consumer electronics companies should take into account the expected use -- or misuse -- of a product when it is designed: "I find it hard to imagine that a person making phones doesn't expect people to use them while driving," he said. "There's just so much technology flooding in. There's an assumption that until someone dies, they won't do anything about it." The Consumer Electronics Association says safety is the "paramount consideration" when manufacturers design in-car electronic devices. "However, no matter how well-designed, no product can substitute for clear driver focus and safe driving behaviors," the group says in a statement on its Web site. The association says there should be room for future innovations that can benefit drivers. "For example, regulations should not prohibit voice-operated texting where the real concern is manual entry and operation of hand-held devices," the Consumer Electronics Association said in a statement. The next big issue is likely to be whether cars should have technology that could allow drivers to browse the Internet. "Browsing the Internet? That's definitely not an application I would say that's suited for the car when the car is moving," said David Jumpa, senior vice president of Airbiquity. Chrysler Group, General Motors Co. and Volkswagen AG are among the automakers that make aftermarket routers available to drivers of some vehicles. Drivers can use the routers to create a small wireless hotspot in and around the car. In theory, this mostly benefits children using mobile devices or playing video games in the back seat or front-seat passengers who want to stream music into the car from the Internet. Even Ford is on the bandwagon. Its next-generation version of Sync will allow people to bring their own mobile broadband modem into the car. And if the vehicle has the new MyFord Touch technology package, people will be able to browse the Web on an eight-inch touch screen -- but only while the vehicle is parked. Concerns about distraction are unlikely to stop the quest to keep drivers connected. Delphi's Schumacher said customers are demanding it. "People are spending more and more time in their vehicles, and they want that time to be productive and convenient," he said. "The customers are ahead of us. We need to catch up."